Posted on 7th December 2016 in "Times Square"
This ad promoting the movie’s opening has the same art as the one published previously in the Leader, but with the addition of the theaters it will be in. It’s essentially a black-and-white version of the quad poster, the top half of the painting by Cummins. It appeared in a film magazine, but I don’t know which one. 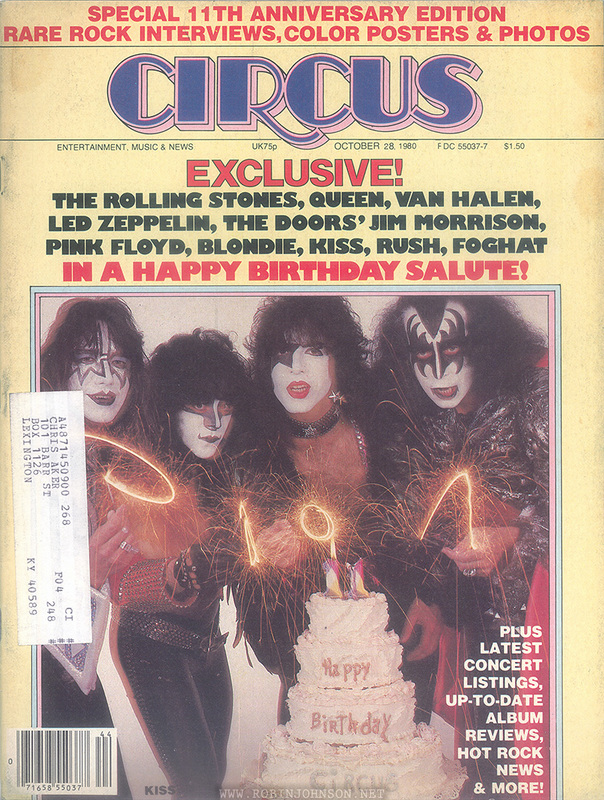 It’s on heavy magazine stock, not newsprint, and on the back is an ad for Seems Like Old Times, but unfortunately the portion of the page I have doesn’t have the name of the magazine or the page number. ROBERT STIGWOOD Presents "TIMES SQUARE"
Released by COLUMBIA-EMI-WARNER Distributors Limited. A Member of the THORN EMI Group. Posted on 28th October 2016 in "Times Square"
A standard one-sheet movie poster is 40 inches high by 27 inches wide. A “quad” poster, which I don’t think they make anymore, is 40 inches wide by 30 inches high. EMI took this extra space and zoomed in on the top two-thirds of the painting, cutting it off just above the artist’s signature. Overall it’s a more pleasing layout, with the credits in the lower left corner over the wet street, and the two inset photos next to each other in the lower right. The photo of Tim Curry has been changed to TS-66-28/8 from the US press kit and AFD Campaign Pressbook, and the photo of Pammy and Nicky is TS-72-8A/14, also from the US press kit and the Campaign Pressbook. Neither of these photos were in the UK Press Kit (at least not in my copy). Perhaps this poster was put together first, and when the one-sheet was designed the American stills were replaced with British ones. 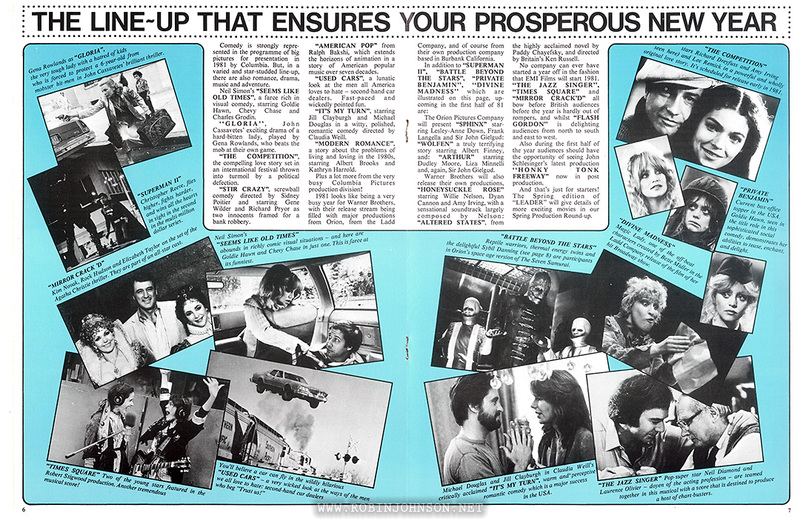 This was the layout used for the newspaper and magazine theater advertisements for the movie’s run. EMI A Member of the THORN EMI Group. 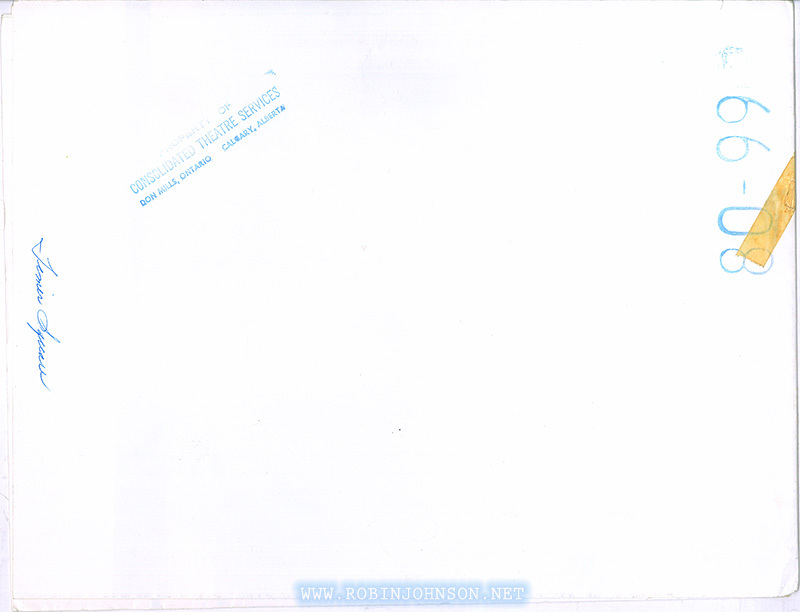 This copyright advertising material is licensed and not sold and is the Property of National Screen Service Ltd.
and upon completion of the exhibition for which it has been licensed it should be returned to National Screen Service Ltd.
Posted on 18th October 2016 in "Times Square"
After all the work that went into creating the logo on the cover of the UK Press Kit, and the poster-worthy image that had been used to promote the movie’s production in the 21-28 June, 1980 Screen International, EMI went with this image for the UK movie poster. The painting of a frightfully gaunt Nicky, signed by “Cummins” (about whom I’ve been unable to find any information), was used for all the UK movie advertising, and for several of the other European posters. 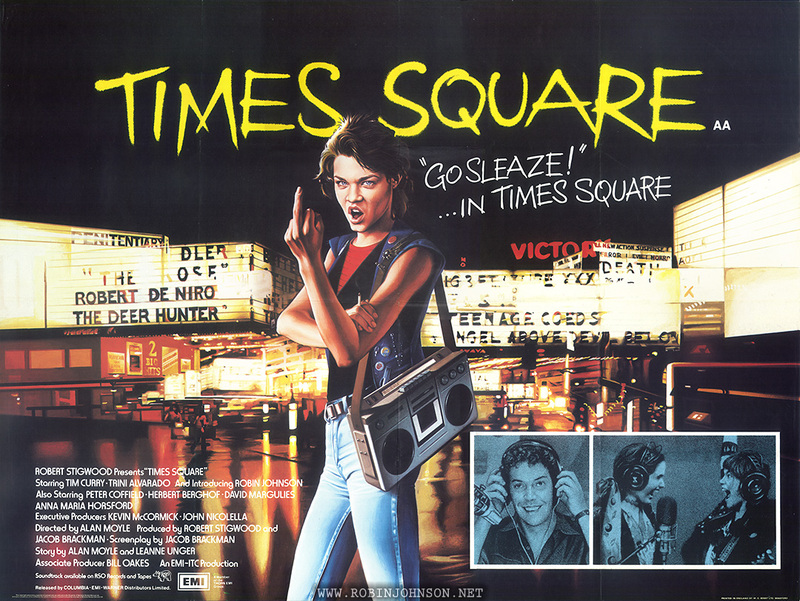 The film title and “‘Go Sleaze! …in Times Square” tagline are in a jagged faux-handwriting that’s probably supposed to look like graffiti, but doesn’t. The small inset photos are the same ones used as insets on the inside of the UK Press Kit. 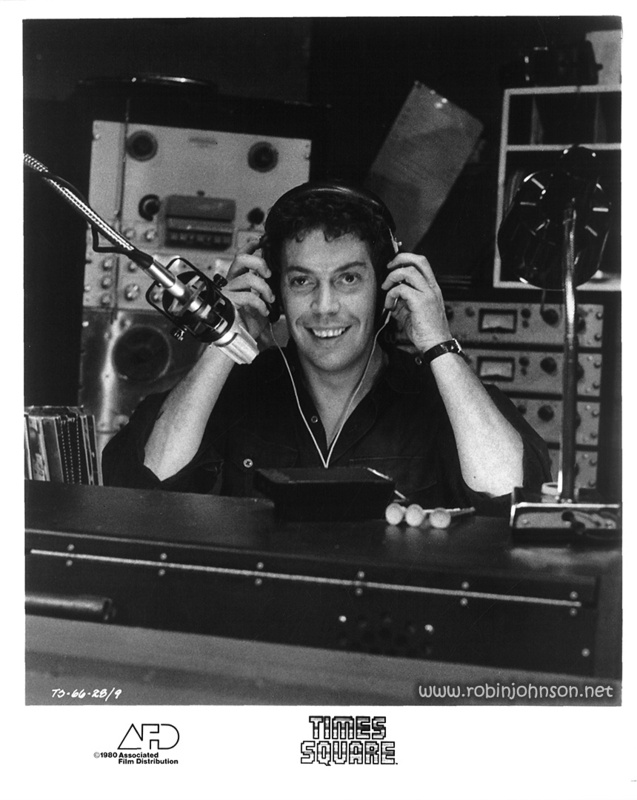 The photo of Tim Curry is #4 from that Press Kit, previously published in The Aquarian in April 1980 and the September-October 1980 Prevue. 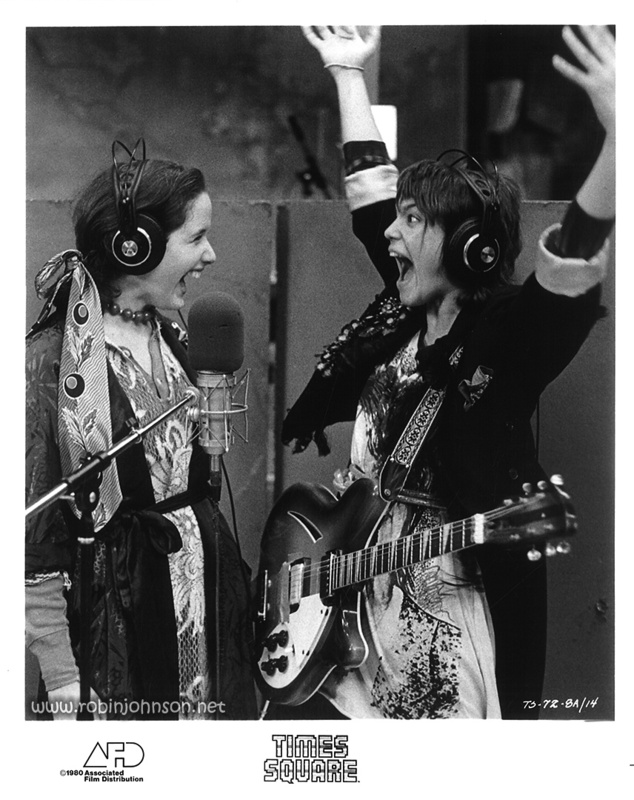 The one of Robin and Trini is TS-22-11, or 1, from the UK Press Kit, depending on which copy I’ve pulled out first. The posters and ads that used this painting didn’t all use the same photos as the insets. 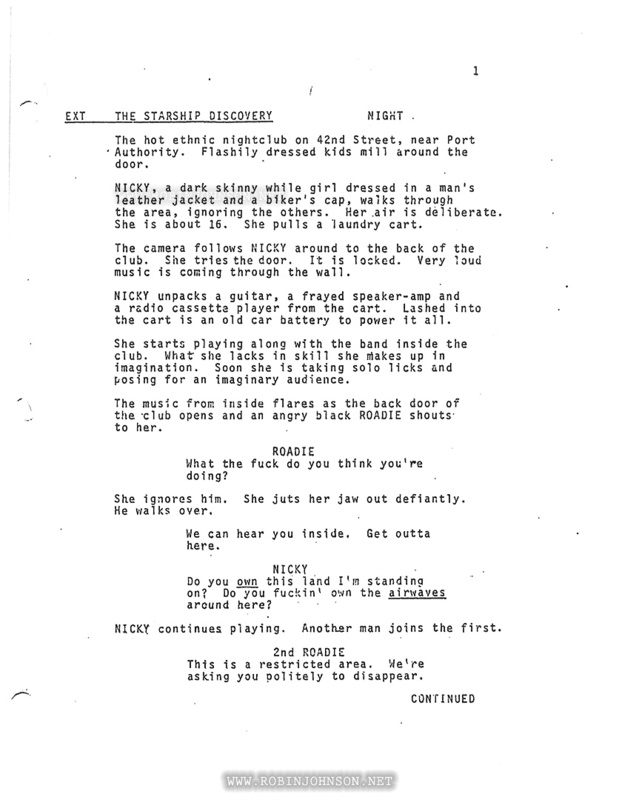 Nicky is first described in the 1979 screenplay as a “dark, skinny white girl.” We know Robin didn’t fit Allan Moyle’s original idea of what his Nicky looked like, winning the part through sheer charisma and making it hers. It’s possible that Cummins was working from a combination of photos of Robin and earlier descriptions of Nicky, coming up with this angry, and hungry, creature of the streets. Distributed by EMI Films Limited. EMI A Member of the THORN EMI Group. Posted on 29th August 2016 in "Times Square"
Leader was a vehicle by which Columbia-EMI-Warner film distributors promoted all their new films to UK theater owners. 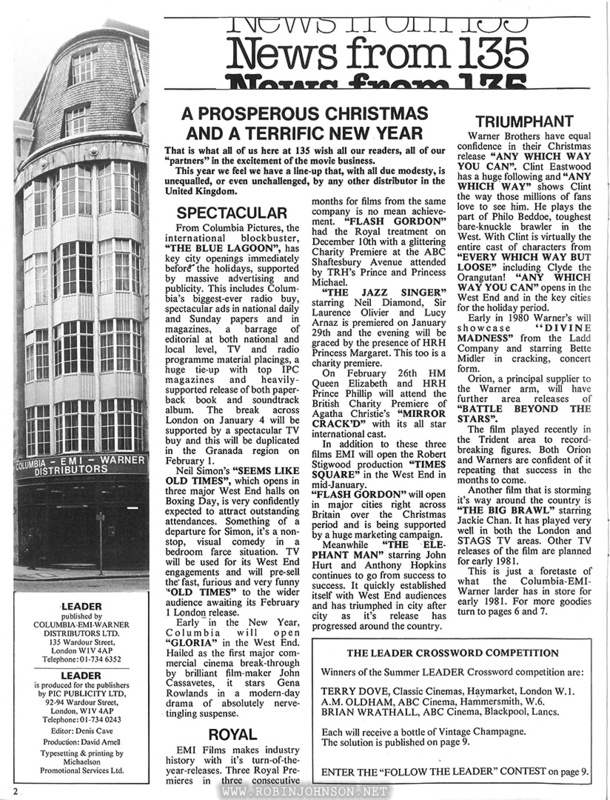 As Times Square was set to open in mid-January, it had a few mentions and an advertisement in the Winter edition, although it looks like the distributors were betting their big money on Flash Gordon, which had already had its premiere. EMI Films makes industry history with it’s turn-of-the-year-releases. Three Royal Premieres in three consecutive months for films from the same company is no mean achievement. “FLASH GORDON” had the Royal treatment on December 10th with a glittering Charity Premiere at the ABC Shaftesbury Avenue attended by TRH’s Prince and Princess Michael. “THE JAZZ SINGER” starring Neil Diamond, Sir Laurence Olivier and Lucy Arnaz is premiered on January 29th and the evening will be graced by the presence of HRH Princess Margaret. This too is a charity premiere. On February 26th HM Queen Elizabeth and HRH Prince Phillip will attend the British Charity Premiere of Agatha Christie’s “MIRROR CRACK’D” with its all star international cast. In addition to these three films EMI will open the Robert Stigwood production “TIMES SQUARE” in the West End in mid-January. “FLASH GORDON” will open in major cities right across Britain over the Christmas period and is being supported by a huge marketing campaign. 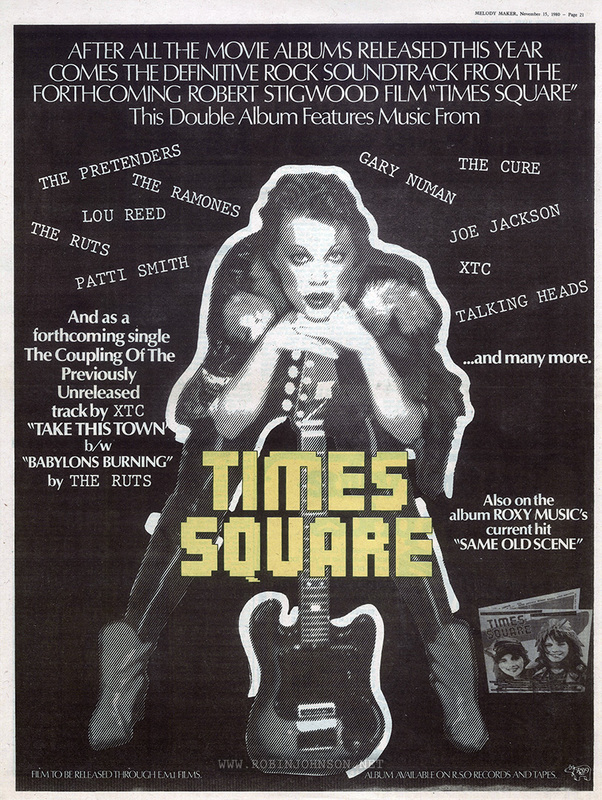 Times Square was apparently the only winter 1980-81 EMI premiere not to get the royal treatment. 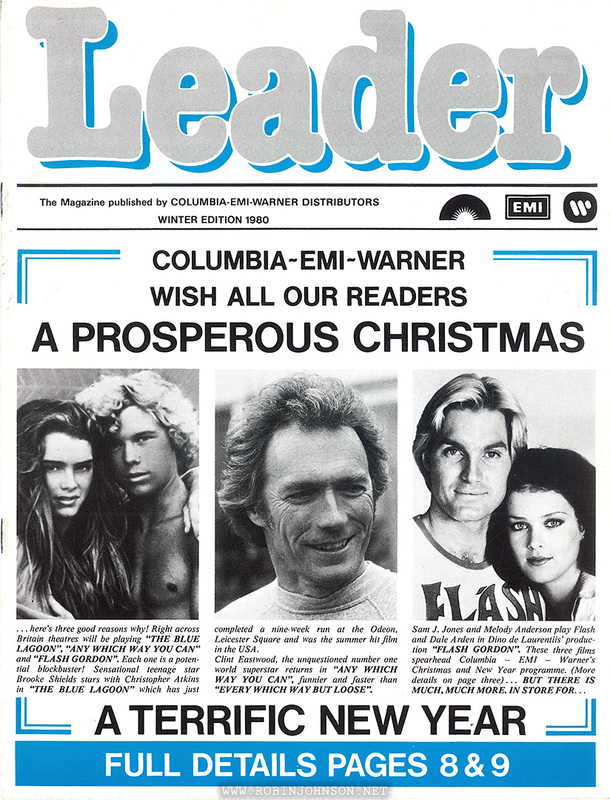 The center spread publicized all the films of the season, and again mentioned Times Square along with the the other three EMI films while giving a special shout-out to Flash Gordon. No company can ever have started a year off in the fashion that EMI Films will start 1981. 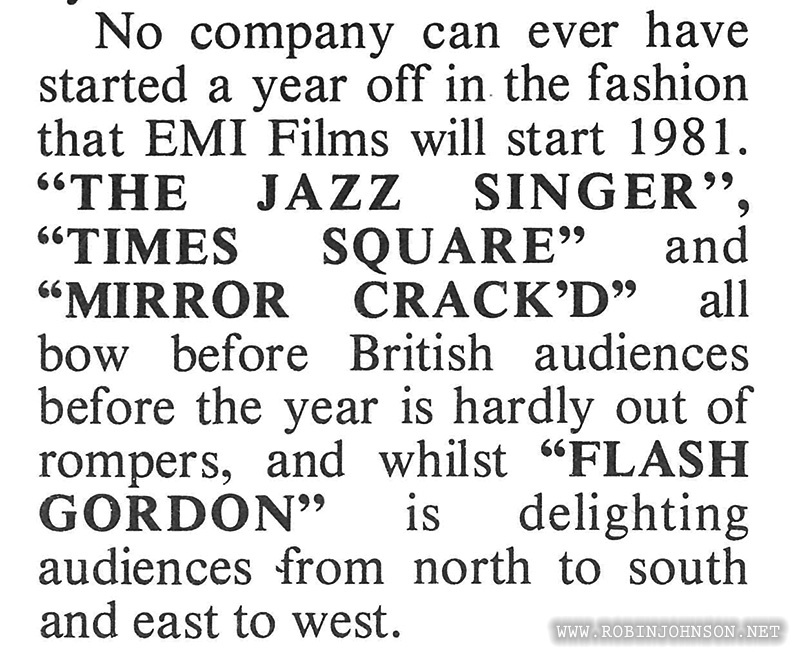 “THE JAZZ SINGER”, “TIMES SQUARE” and “MIRROR CRACK’D” all bow before British audiences before the year is hardly out of rompers, and whilst “FLASH GORDON” is delighting audiences from north to south and east to west. 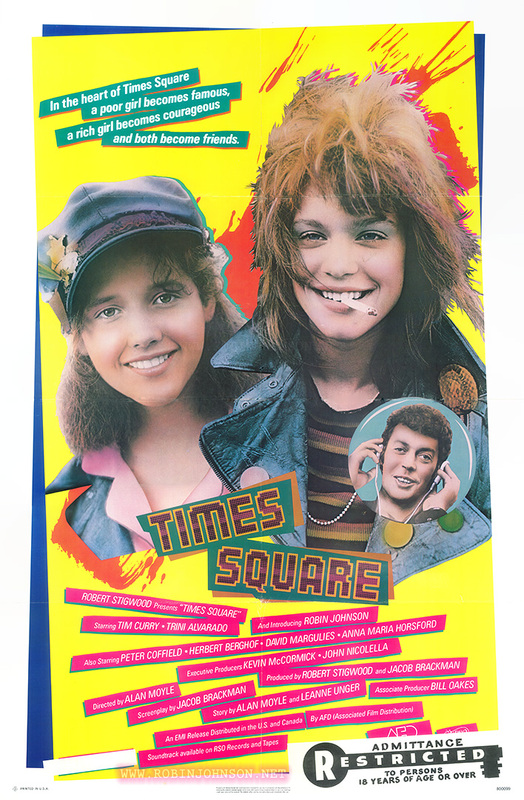 At least Times Square got a picture… the image used was a cropped version of TS-72-8A/14, also seen in the AFD Campaign Pressbook, on the cover of the UK soundtrack sampler, as the cover of the Japanese soundtrack sampler, and cropped even further in the December 23 US magazine. The caption was a sneaky plug for the soundtrack album. 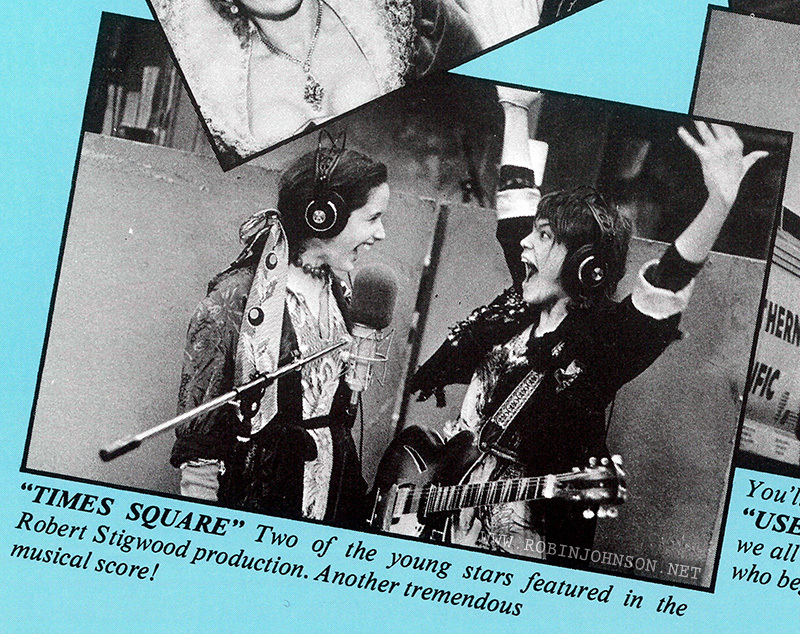 “TIMES SQUARE” Two of the young stars featured in the Robert Stigwood production. Another tremendous musical score! Finally, on page 10, was a half-page ad. After all the work that went into the logo on the cover of the UK Press Kit, it was tossed aside in favor of what you see here. Nearly all the UK advertising materials used this logo and the painted image of a frighteningly skinny Nicky. I’ll gripe more about that when I get to the movie poster. Posted on 11th May 2016 in "Times Square"
FILM TO BE RELEASED THROUGH E.M.I. FILMS. Posted on 21st April 2016 in "Times Square"
Sorry to jump back in time a few weeks, but I only just got this one. It’s another full-page movie teaser ad, this one from page 29 of the the October 30 Rolling Stone. It’s the same as the others, only bigger. Well, that and the colors behind the tagline and the strip at the bottom, which have changed from blue and black, respectively, to green. 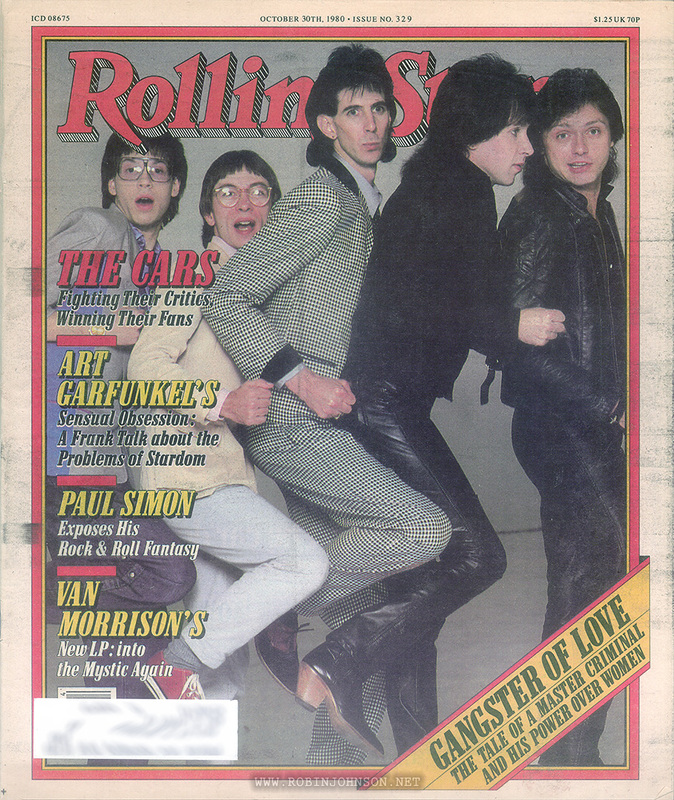 The Cars were the cover story in this issue. Other films that had full-page ads were Bad Timing and Motel Hell. Bad Timing was also the main topic of an interview with Art Garfunkel, while Paul Simon gave an interview about his movie One Trick Pony. The big news was the death of John Bonham. 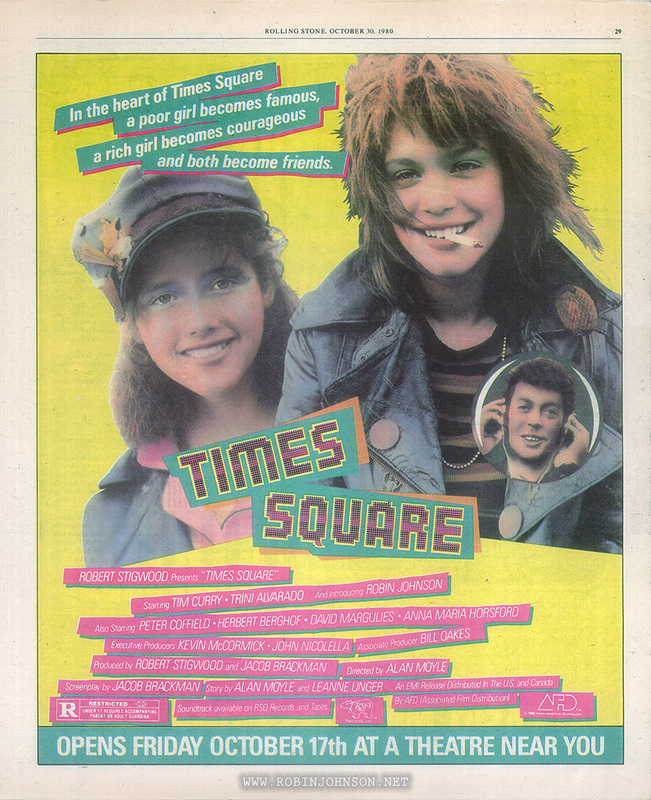 None of which has anything to do with Robin Johnson or Times Square, except maybe as a partial illustration of the world in which the movie was being released, and the 1980 Rolling Stone audience to whom the filmmakers were trying to market it here. 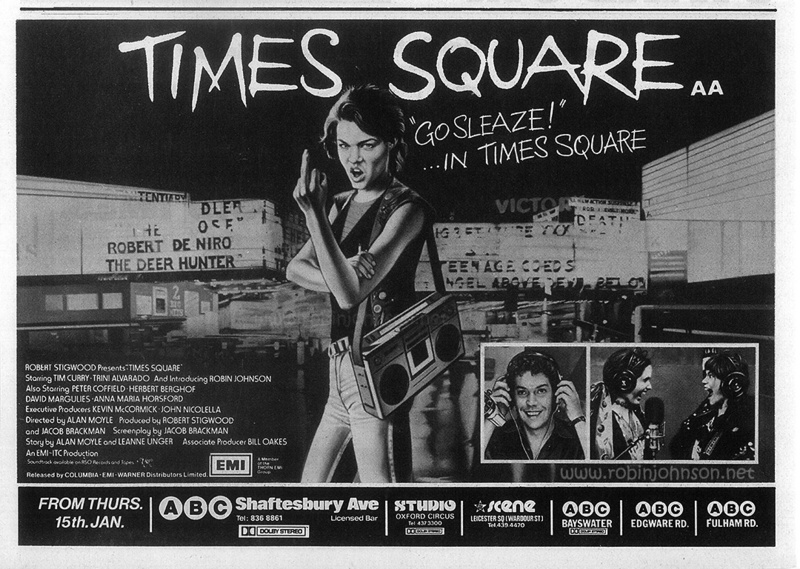 “Times Square” Rolling Stone 30 Oct. 1980: 29. Print. 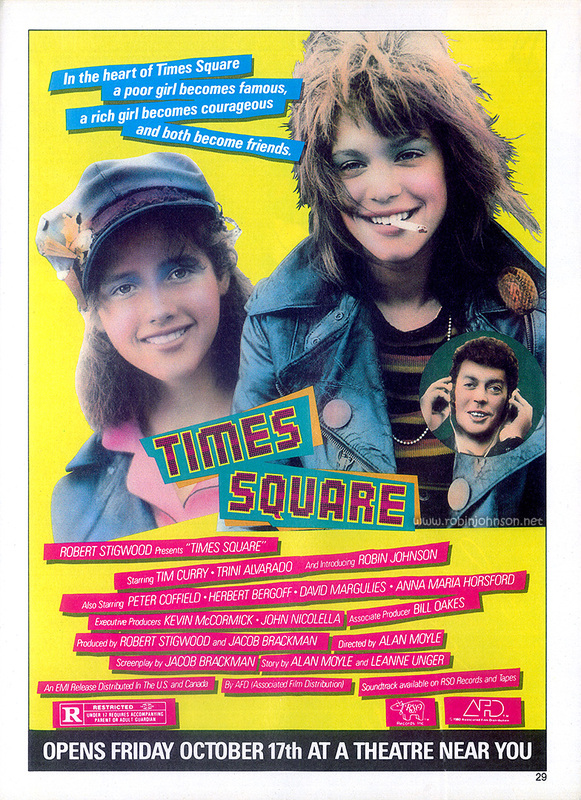 ©1980 Straight Arrow Publishers Inc.
Posted on 1st April 2016 in "Times Square"
This was in the local paper Sunday, October 19, and since I wouldn’t have clipped it before I’d seen the movie, Kurt and I must have seen it either opening night or Saturday. I remember we’d been looking forward to the New Tim Curry movie, and I guess now we’d been REALLY looking forward to it. There aren’t times listed for Friday or Saturday so I can’t be certain what showing it was, but I seem to recall wandering around the record stores in the mall after while waiting for whichever of our parents was coming to pick us up, so the 6:30 is a good bet. I also saw it once again on my own after that, and made another round of the record stores, but I don’t remember what day that might have been. I do know that, though I may have gone the first time for Tim, I went back for Robin. The Quaker Bridge 4 was the only area theater it was in. I think it ran for two weeks. Posted on 12th March 2016 in "Times Square"
Unlike Tiger Beat, Circus was too cool to mention Times Square anywhere in the editorial content. 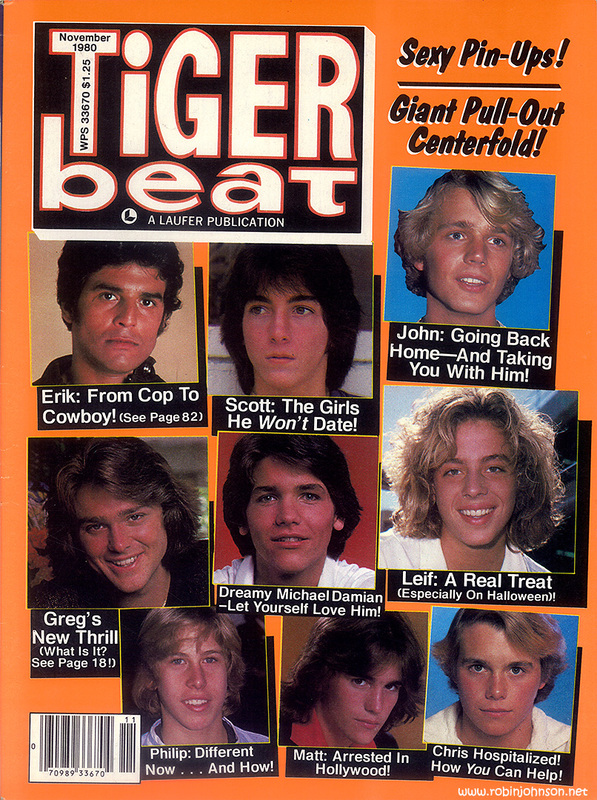 Posted on 2nd March 2016 in "Times Square"
The November Tiger Beat also came out before Times Square’s October release, judging by the full-page teaser ad that ran on page 29. In fact we can narrow down the date it came out to sometime between the releases of the first two singles from the soundtrack, as that’s stated explicitly in the scarily enthusiastic soundtrack review found on page 59, which was apparently written by someone with a third-hand synopsis of the movie that had come from someone who’d given the film’s publicity materials the most cursory of glances. Posted on 21st February 2016 in "Times Square"
The movie poster for Times Square in Canada is almost identical to the U.S. poster. 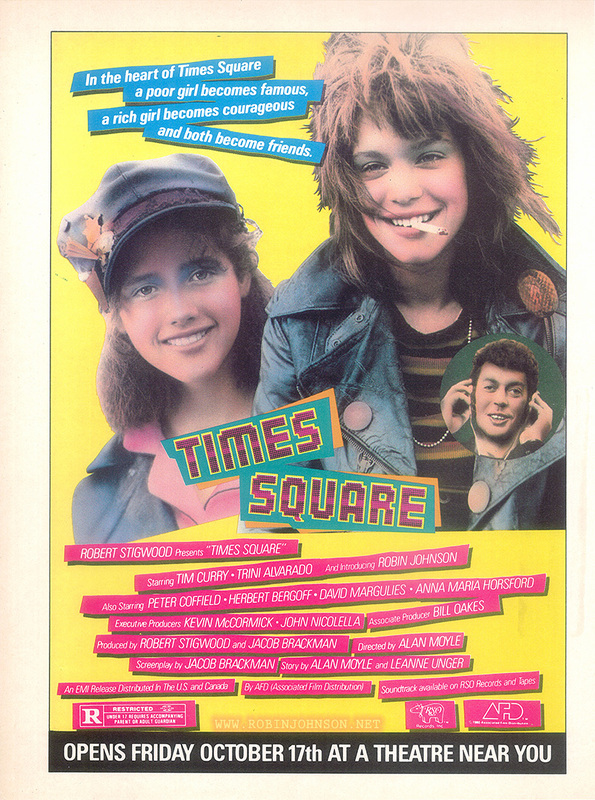 In fact, it is a U.S. poster, with two white stickers affixed to the bottom, one covering the American “R” rating barring under-17’s without a parent or guardian, and the other adding the Canadian “R” rating barring under-18’s entirely. Sorry, Canadian kids. The back proudly bears stamps reading “PROPERTY OF CONSOLIDATED THEATRE SERVICES DON MILLS, ONTARIO | CALGARY, ALBERTA” and “80-99”. 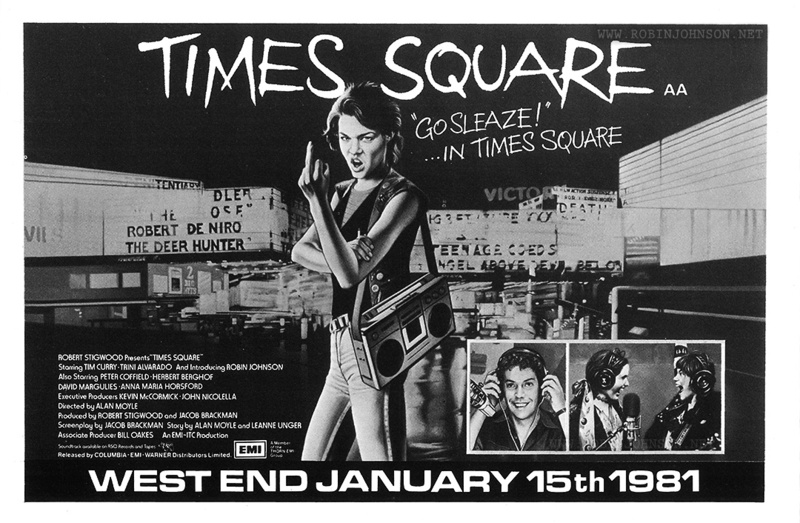 In the USA, 80-99-9 was the number assigned to Times Square by National Screen Service, and the poster itself has the number 800099 on the front. 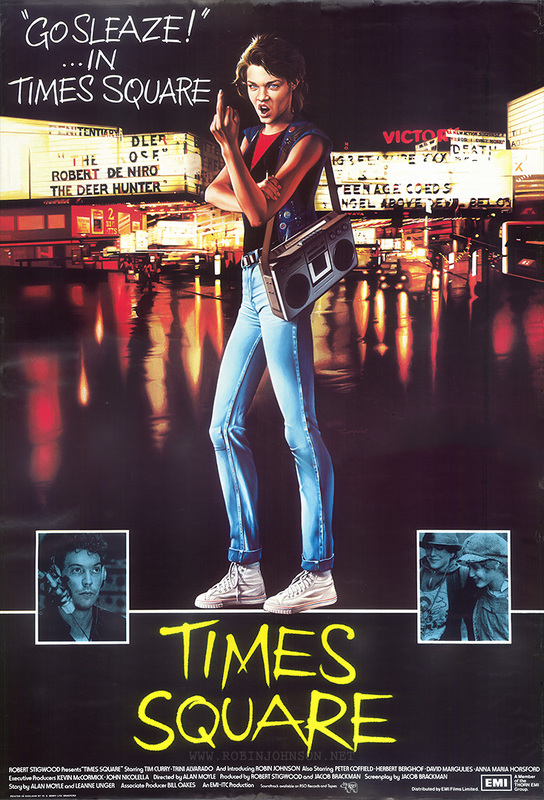 I believe the handwritten “Times Square” to have been added later, by a movie memorabilia dealer through whose hands the poster passed on its way to me. Property of National Screen Service Corporation. Licensed for use only in connection with the exhibition of this picture at the theatre licensing this material. Licensee agrees not to trade, sell or give it away, or permit others to use it, nor shall licensee be entitled to any credit upon return of this material. This material either must be returned or destroyed immediately after use.